Built by Epcon Communities, The Villas at Culp Arbor is a maintenance-free community in Chapel Hill, NC for active adults aged 55 or better. However, ten percent of residents can be under 55. The community also welcomes pets under responsible ownership. Upon completion, The Villas at Culp Arbor will be comprised of 64 one-of-a-kind single-family and attached homes. The flowing open designs feature high ceilings and lots of windows that let in plenty of natural light. Located within proximity of shops, medical facilities, entertainment venues and the RDU Airport; this community offers all of the amenities and none of the maintenance hassles, making it suitable for an active adult lifestyle. Just steps away from each residence, a designer-decorated amenities center functions as the social, fitness and recreational community centerpiece. Residents are greeted by an inviting see-through fireplace and large windows that enhance the clubhouse's welcoming appeal even further. With 24-hour access, the resort-style amenities include an outdoor swimming pool and a deluxe kitchen that is ideal for entertaining, and paved walking trails. Residents also have use of several gathering rooms where they can start the day off with a cup of coffee, meet for a game of cards, watch the game on a big TV screen, delve into books, or enjoy a game or two of billiards. The health and fitness center is ideal for engaging in a rigorous or relaxing workout. The Villas at Culp Arbor is comprised of single-story attached homes that feature two bedrooms on opposite sides of the residences, two bathrooms, and large two-car garages with attic storage access. Active adult buyers can select from four floor plans that offer between 1,137 and 1,806 square feet of living space. Homes have private enclosed courtyards, often with fire pits, fountains or trellises; and feature high cathedral ceilings, large windows, and ceramic tile floors in the foyers. The roomy layouts have lots of storage options, oversized laundry rooms and spacious kitchen islands. Homes have energy-efficient insulation packages, high-efficiency (90%) gas furnaces and high-efficiency (13 SEER) electric central air conditioning. The Villas at Culp Arbor will also offer single-family homes. Residents will have the option of choosing from three different floor plans and many customizable options. These homes will range anywhere from 1,519 to 1,995, offer two bedrooms, two bathrooms, and an attached two-and-a-half car garage. Some homes will also feature a den for additional space. Epcon Communities carefully selects building materials to create high-quality exteriors and to minimize maintenance. Construction elements include high roof pitch, windows with low-e glass and screens, color-coordinated lap and cedar impressions siding, and beautifully landscaped lawn areas with sprinkler irrigation. One of the community's mottos is "no steps, no mowing" and true to these words, residents enjoy a maintenance-free lifestyle. Home owners of The Villas at Culp Arbor enjoy privacy while having the satisfaction of owning a place to entertain friends and family in style and comfort. It is easy to make friends here, keep fit and healthy, and maintain and enhance social connections. For residents who love to travel, they can lock and leave with peace of mind. Situated in Chapel Hill at the intersection of Interstate 40 and NC 54 (Raleigh Road), The Villas at Culp Arbor is conveniently located to farmers markets, botanical gardens, golf courses, performing arts centers, shops and churches. Major shopping options in the vicinity include the Southpoint Mall, Hope Valley Commons and The Shops at Eastgate. Particular places of interest include the Morehead Planetarium and Sciences Center, the Museum of Life and Science, Sarah P. Duke Gardens, the Durham Performing Arts Center, the Ackland Art Museum and Eno River State Park. The Villas at Culp Arbor in Chapel Hill has the ideal location for an active adult community near Raleigh-Durham, NC. There are plenty of activities available in The Villas at Culp Arbor. Here is a sample of some of the clubs, activities and classes offered here. Active adult buyers can select from four floor plans that offer between 1,137 and 1,806 square feet of living space. Homes have private enclosed courtyards, often with fire pits, fountains or trellises; and feature high cathedral ceilings, large windows, and ceramic tile floors in the foyers. The roomy layouts have lots of storage options, oversized laundry rooms and spacious kitchen islands. Homes have energy-efficient insulation packages, high-efficiency (90%) gas furnaces and high-efficiency (13 SEER) electric central air conditioning. The Villas at Culp Arbor will also offer single-family homes. Residents will have the option of choosing from three different floor plans and many customizable options. These homes will range anywhere from 1,519 to 1,995, offer two bedrooms, two bathrooms, and an attached two-and-a-half car garage. Some homes will also feature a den as well as an optional second floor with a bedroom and bathroom for additional space. I moved in this past spring and so far it's been great. The clubhouse is small but has everything I wanted to help me stay in shape and socialize. I have the Ducal plan and it is perfect for my home office and for when my daughter visits with her family. 55places.com is not affiliated with the developer(s) or homeowners association of The Villas at Culp Arbor. The information you submit is distributed to a 55places.com Partner Agent, who is a licensed real estate agent. 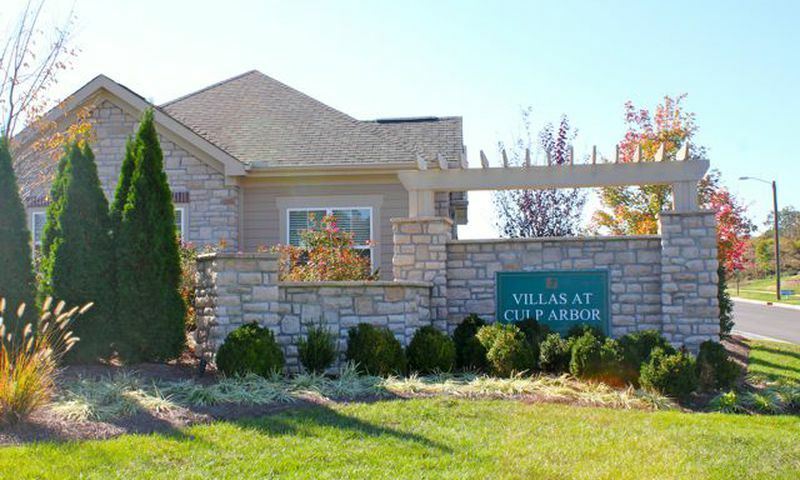 The information regarding The Villas at Culp Arbor has not been verified or approved by the developer or homeowners association. Please verify all information prior to purchasing. 55places.com is not responsible for any errors regarding the information displayed on this website.